SEOUL, South Korea (AP) — The late Rev. 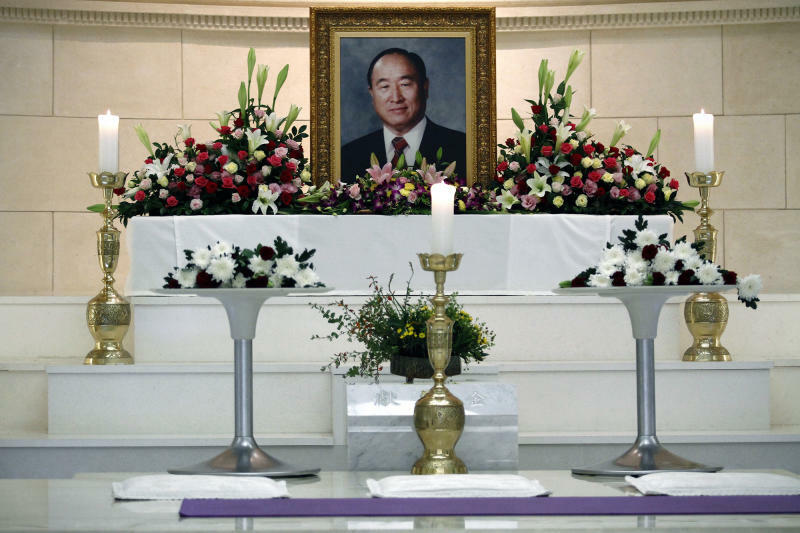 Sun Myung Moon, the Unification Church founder who died this week at 92, had 14 children with his second wife, Hak Ja Han Moon, according to his autobiography. He also had one child with his first wife, officials say, and at least one illegitimate child, according to one of his daughters. The Moons' eldest son, he reportedly died of a heart attack in 2008. Born in 1962, he was a musician and producer and recorded more than a dozen albums, according to a church-affiliated website. His former wife, Nonsook Hong, claimed he was an alcoholic and drug addict who beat her, including while she was seven months pregnant with their fifth child. He was given huge amounts of cash by his mother that he used to buy cocaine and throw parties, Hong told the U.S. television news program "60 Minutes" in 1998. She said she was chosen by the Rev. Moon to marry Hyo-jin when she was 15. Born in 1969, he went to Columbia and Harvard Business School and twice competed in the Olympics for the South Korean equestrian team, according to the church-affiliated website. He played a leading role in church business and media interests, including the Washington Times newspaper, but he has also been involved in rifts with his siblings and parents. His company sued his mother's missionary group in 2011, demanding the return of more than $22 million the company claimed was sent without its consent to her group. A court ruled that the money was a loan but ordered it returned, the church said. 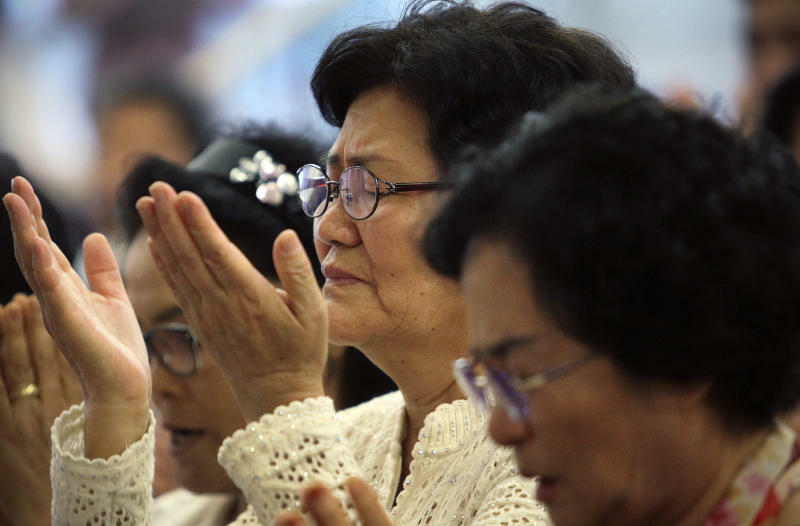 Preston is still in charge of a church organization in the United States, Unification Church International, but church officials said they have asked him to leave the job. Born in New York in 1979 and educated at Harvard, he is the Moons' youngest son and the church head. He practiced Buddhism when younger, shaving his head and wearing monastic robes, and said he turned to the religion after a brother died in what U.S. officials called a suicide. He said he worried about his father's reaction to the religious decision but the Rev. Moon told followers not to criticize him. He titled a book of his essays, "A Bald Head and a Strawberry." He was chosen to lead the church in 2008. He is more fluent in English than Korean, and many of his English sermons are designed to appeal to young followers. Justin, 42, was the last of the children born in South Korea and also went to Harvard, the church website said. He runs the Tongil Group, the church's business arm, and owns U.S.-based gun manufacturer Kahr Arms. Born in the United States, she is a graduate of New York University in journalism and economics, according to the church-affiliated website. She also briefly appeared on a TV reality show in the U.S., "Survival of the Richest," in 2006. Press reviews of the first episode reported her family fortune as $989 million and said she claimed to suffer from "chronic boredom" — and that she was voted off the show by the other rich kids at the end of the first episode. The 21-year-old committed suicide in 1999 by jumping from the 17th floor of a hotel in downtown Reno, Nevada, local officials said. He had been visiting the University of Nevada campus and considering whether to study hotel management there or at home in Las Vegas, church officials said at the time. Young-jin was said to not be heavily involved in the church. A church newsletter said his November 1997 wedding "set the stage for the blessing of 3.6 million couples worldwide." The 17-year-old died in 1984 when the car he was driving collided with a tractor-trailer in New York. He had been engaged to the prima ballerina daughter of Bo Hi Pak, the head of the church's Korean Cultural Foundation, and their wedding went ahead as planned despite his death. He was wed posthumously in a "spiritual" marriage to Julia Moon, who is now a prominent figure in South Korea's arts scene. Sung-jin was born in 1946 to Rev. 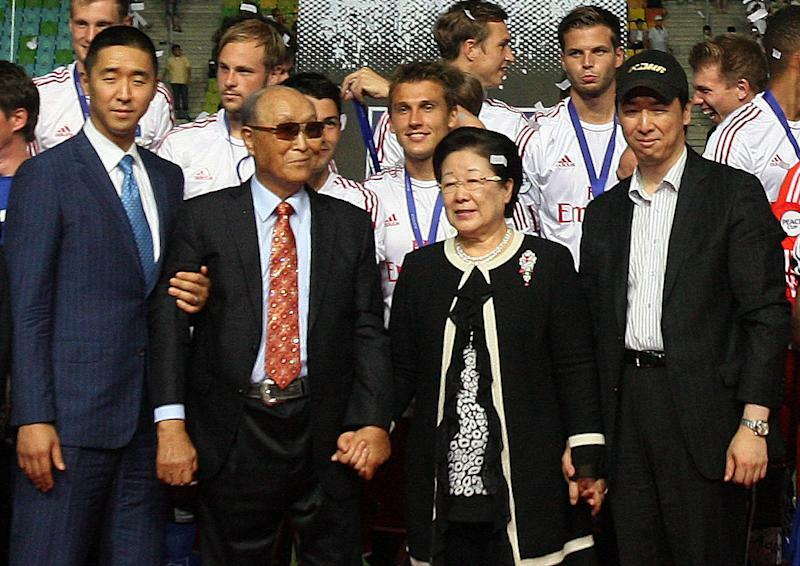 Moon and his first wife, Choi Sun-kil, and lives in Japan, according to church officials and a church defector, Lee Young-sun. The Moons' third daughter was born in South Korea and moved to the United States with her family in 1973, the church-affiliated website said. She went to Columbia and Harvard and was appointed president and CEO of the Unification Church in America in August 2008, according to the website.